"Unclean! Unclean!" These were the words of lepers as they announced their presence among the unafflicted in biblical times. The mere mention of leprosy has struck fear in the hearts of people for thousands of years. Even though it is one of the least contagious of all bacterial diseases, the fear of physical disfigurement and the loss of social status that it brings, has made leprosy one of the most dreaded of all diseases. Lepers have been ostracized and put into separate colonies, where they lived as social outcasts and "untouchables" until the end of their lives. Leprosy or Hansen's disease is a chronic infectious disease caused by the bacterium Mycobacterium leprae and is the only known bacterium that infects peripheral nerves. It also affects the mucosa of the upper respiratory tract and produces skin lesions (Ryan et al. 2004). If left untreated, there can be progressive and permanent damage to the skin, nerves, limbs and eyes. Many people have felt a religious calling to risk contracting the disease themselves in order to care for lepers. Some of these most noble people include Father Damien of Molokai, Hawaii; Dr. Albert Schweitzer in Lamberene, Gabon; and Mother Teresa in Calcutta, India. The crucial breakthrough in the cure for leprosy came when G. H. A. Hansen followed the lead of Robert Koch, who first suggested that microorganisms could cause disease. When Hansen began to look into the "invisible" world for the cause of leprosy, he risked everything he had in order to help those that no one else wanted to touch. A disease called "leprosy" was recorded in ancient India (fifteenth century B.C.E. ), in Japan (tenth century B.C.E. ), and in Egypt (sixteenth century B.C.E.). Some propose that the spread of this disease to the West originated from Egypt (Souvay and Donovan 1910). In the sixth century C.E., Saint Radegund was praised for dedicating her life to caring for lepers. In 1078 C.E., a leprosarium was built in Rochester, England, and in 1084 Archbishop Lanfranc built another at Harbledown near Canterbury for the care of 100 lepers. These became known as lazar houses, based on the story of Lararus, and many were built during the twelfth and thirteenth centuries (Turner et al. 1995). The English monk, Orderic Vitalis, writes in the twelfth century C.E., of another monk, Ralf, who was so overcome by the plight of lepers that he prayed to catch leprosy himself (which he eventually did). The leper would carry a clapper and bell to warn of his approach, and this was as much to attract attention for charity as to warn people that a diseased person was near. In 1873, Mycobacterium leprae, the causative agent of leprosy, was discovered by G. H. Armauer Hansen in Norway , making it the first bacterium to be identified as causing disease in man (Hansen 1874; Irgens 2002). From 1873 to 1899, Father Damien worked in the leper colony of Kalaupapa on the island of Molokai in Hawaii. He eventually contracted leprosy and died at age 49. On June 4, 1995, Pope John Paul II beatified Blessed Damien and gave him his official spiritual title. In 1913, Dr. Albert Schweitzer began his work in Lamberene, Gabon, where he labored for more than 40 years until his death in 1965. Many of his patients were lepers. In 1953, he received the Nobel Peace Prize, and spent the prize money to build a clinic for his hospital. In 1950, Mother Teresa started the Missionaries of Charity in Calcutta, India. She persuaded the leaders that leprosy was not contagious and got the lepers to build a colony at Titagarh that she named after Mahatma Gandhi. In 1979, she was awarded the Nobel Peace Prize for her lifelong work with the poor. In 1995, the World Health Organization (WHO) estimated that between two and three million individuals were permanently disabled because of leprosy (WHO 1995). The word "leprosy" derives from the ancient Greek words lepros, a "scale," and lepein, "to peel" (Barnhart 1995). The word came into the English language via Latin and Old French. The first attested English use is in the Ancrene Wisse, a thirteenth-century manual for nuns ("Moyseses hond…bisemde o þe spitel uuel & þuhte lepruse." The Middle English Dictionary, s.v., "leprous"). A roughly contemporaneous use is attested in the Anglo-Norman Dialogues of Saint Gregory, "Esmondez i sont li lieprous" (Anglo-Norman Dictionary, s.v., "leprus"). The term Tzaraath from the Hebrew Bible is commonly translated as leprosy, although the symptoms of Tzaraath are not entirely consistent with leprosy and might refer to a variety of skin disorders other than Hansen's disease (Heller et al. 2003). In particular tinea capitis, a fungal scalp infection and related infections on other body parts caused by the dermatophyte fungus Trichophyton violaceum, are abundant throughout the Middle East and North Africa today and might also have been common in biblical times. Similarly, the related agent of the disfiguring skin disease favus, Trichophyton schoenleinii, appears to have been common throughout Eurasia and Africa before the advent of modern medicine. People with severe favus and similar fungal diseases along with other skin diseases not caused by microorganisms tended to be classed as having leprosy as late as the seventeenth century in Europe (Kane et al. 1997). This is clearly shown in the painting Governors of the Home for Lepers at Haarlem 1667 by Jan de Bray, where a young Dutch man with a vivid scalp infection, almost certainly caused by a fungus, is shown being cared for by three officials of a charitable home intended for leprosy sufferers. 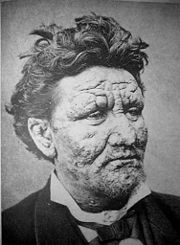 The use of the word "leprosy" before the mid-nineteenth century, when microscopic examination of skin for medical diagnosis was first developed, can seldom be correlated reliably with Hansen's disease as we understand it today. Mycobacterium leprae is a rod-shaped bacterium with an affinity for acid-fast stains. Its length varies from 1-8 microns and it is 0.2 microns wide. It has the longest doubling time of all known bacteria and has thwarted every effort at culture in a defined medium (Truman et al 2001). It can be grown in the foot pads of mice and armadillos and some primates. Less than half of the genome of M. leprae contains functional genes. Gene deletion and decay appear to have eliminated many important metabolic activities, including siderophore production, part of the oxidative and most of the microaerophilic and anaerobic respiratory chains, and numerous catabolic systems and their regulatory circuits ( Cole et al. 1998). The genome sequence of a strain of M. leprae, originally isolated in Tamil Nadu and designated TN, has been completed recently. The genome sequence was found to contain 3,268,203 base-pairs (bp), and to have an average G+C content of 57.8 percent, values much lower than the corresponding values for M. tuberculosis, which are 4,441,529 bp and 65.6 percent G+C. There are 1500 genes that are common to both M. leprae and M. tuberculosis. There is speculation that as M. leprae evolved it may have lost many genes (Cole et al. 2001). The clinical manifestations of leprosy vary but primarily affect the skin, nerves, and mucous membranes (Naafs et al. 2001). Patients with this chronic infectious disease are classified as having either: (1) paucibacillary (tuberculoid leprosy), (2) multibacillary Hansen's disease (lepromatous leprosy), or (3) borderline leprosy. Paucibacillary Hansen's disease is characterized by one or more hypopigmented skin macules and anaesthetic patches, i.e., damaged peripheral nerves that have been attacked by the human host's immune cells. Multibacillary Hansen's disease is associated with symmetric skin lesions, nodules, plaques, thickened dermis, and frequent involvement of the nasal mucosa resulting in nasal congestion and epistaxis (nose bleeds), but typically no nerve damage. Contrary to popular belief, Hansen's bacillus does not cause rotting of the flesh. After a long investigation by Paul Brand, it was discovered that insensitivity in the limbs and extremities was the reason why unfelt wounds or lesions, however minute, lead to undetected deterioration of the tissues, the lack of pain not triggering an immediate response as in a fully functioning body. Borderline leprosy (also termed multibacillary), of intermediate severity, is the most common form. Skin lesions resemble tuberculoid leprosy but are more numerous and irregular; large patches may affect a whole limb, and peripheral nerve involvement with weakness and loss of sensation is common. This type is unstable and may become more like lepromatous leprosy or may undergo a reversal reaction, becoming more like the tuberculoid form. Recently, leprosy has also emerged as a problem in HIV patients on antiretroviral drugs (McNeil Jr. 2006). The exact mechanism of transmission of leprosy is not known. M. leprae never has been grown on defined media; as a result it has been difficult to study the pathogenic mechanisms. There is a theory that not all people who are infected with M. leprae develop leprosy, and genetic factors have long been thought to play a role, due to the observation of clustering of leprosy around certain families, and the failure to understand why certain individuals develop lepromatous leprosy while others develop other types of leprosy. However, what is not clear is the role of genetics and other factors in determining this clinical expression. In addition, malnutrition and possible prior exposure to other environmental mycobacteria may play a role in development of the overt disease. There is a belief that the disease is transmitted by contact between infected persons and healthy persons. In general, closeness of contact is related to the dose of infection. Of the various situations that promote close contact, contact within the household is the only one that is easily identified, although the actual incidence among contacts and the relative risk for them appear to vary considerably in different studies. In incidence studies, infection rates for contacts of lepromatous leprosy have varied from 6.2 per 1000 per year in Cebu, Philippines (Doull et al. 1942) to 55.8 per 1000 per year in a part of Southern India (Noordeen et al. 1978). M. leprae leaves the human body through the skin and the nasal mucosa, although their relative importance in contract transmission is not clear. It is true that lepromatous cases show large numbers of organisms deep down in the dermis. However, whether they reach the skin surface in sufficient numbers is doubtful. There are reports of acid-fast bacilli being found in the desquamating epithelium of the skin, but researchers could not find any acid-fast bacilli in the epidermis, even after examining a very large number of specimens from patients and their contacts (Weddell et al. 1963). Fairly large numbers of M. leprae have been found in the superficial keratin layer of the skin of lepromatous leprosy patients, suggesting that the organism could exit along with sebaceous secretions (Job et al. 1999). The importance of the nasal mucosa, especially the ulcerated mucosa, in transmission was recognized as early as 1898 (Schaffer 1898). The quantity of bacilli from nasal mucosal lesions in lepromatous leprosy ranged from 10 thousand to 10 million (Shepard 1960). The majority of lepromatous patients showed leprosy bacilli in their nasal secretions (Pedley 1973), which produced as many as 10 million viable organisms per day (Davey et al. 1974). The entry route of M. leprae into the human body is not definitely known, but the two most likely routes are the skin and upper respiratory tract. The evidence in favor of the respiratory route is on the increase in spite of the long-held belief that the skin was the exclusive route of entry. The successful transmission of leprosy through aerosols containing M. leprae in immune-suppressed mice suggests a similar possibility in humans (Rees et al. 1977). Successful results have been reported with mice when M. leprae were introduced into their nasal cavity by topical application (Chehl et al. 1985). In summary, entry through the respiratory route appears the most probable, although other routes, particularly broken skin, cannot be ruled out. Most investigators think that M. leprae is usually spread from person to person via respiratory droplets (CDC 2005). In leprosy, the reference points for measuring the incubation period, the times of infection, and the onset of disease are difficult to define; the former because of the lack of adequate immunological tools and the latter because of the insidious nature of the onset of leprosy. The minimum incubation period reported is as short as a few weeks, based on the very occasional occurrence of leprosy among young infants (Montestruc et al. 1954). The maximum incubation period reported is as long as 30 years, as observed among war veterans known to have been exposed for short periods in endemic areas but otherwise living in non-endemic areas. It is generally agreed that the average incubation period is between 3 to 5 years. 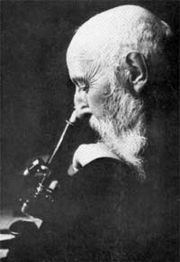 Until the use of dapsone pills, pioneered by Dr. R.G. Cochrane and used at the hospital compound in Carville, Louisiana in 1946, there was no effective cure for leprosy. Dapsone is only weakly bactericidal against M. leprae and it was considered necessary for patients to take the drug indefinitely. When only dapsone was used, it soon resulted in a widespread emergence of resistance. By the 1960s, the world’s only known anti-leprosy drug became virtually useless. The search for more effective anti-leprosy drugs led to the use of clofazimine and rifampicin in the 1960s and 1970s (Rees et al. 1970) and later, to avoid the danger of resistance, combined therapy was formulated using rifampicin and dapsone (Yawalkar et al. 1982). Multidrug therapy (M.D.T. ), combining all three drugs, was first recommended by the World Health Organization in 1981. These three anti-leprosy drugs are still used in the standard M.D.T. regimens. None of them should be used alone because of the risk of developing resistance. The use of M.D.T. was slow and sporadic in most endemic countries over the next decade, due mainly to the high cost of the combined treatment. In 1985 leprosy was still considered a public health problem in 122 countries. The World Health Assembly (W.H.A.) in 1991 passed a resolution to eliminate leprosy as a public health problem by the year 2000. This was defined as reducing the global prevalence of the disease to less than 1 case per 100,000. The World Health Organization (WHO) was given this challenge. The WHO recommended two types of standard M.D.T. regimen be adapted (WHO 1994). The first was a 24-month treatment for multibacillary (MB or lepromatous) cases using rifampicin, clofazimine, and dapsone. The second was a six-month treatment for paucibacillary (PB or tuberculoid) cases, using rifampicin and dapsone. At the First International Conference on the Elimination of Leprosy as a Public Health Problem, held in Hanoi the next year, the global strategy was endorsed and funds were provided to WHO for the procurement and supply of M.D.T. to all endemic countries. Since 1995, WHO has supplied all endemic countries with free M.D.T. in blister packs. This free provision was extended in 2000, and again in 2005, and will run until at least the end of 2010. At the country level, non-government organizations (NGOs) affiliated with the national program will continue to be provided with an appropriate free supply of this M.D.T. by the government. M.D.T. remains highly effective and patients are no longer infectious after the first monthly dose. It is safe and easy to use. Relapse rates remain low, and there is no known resistance to the combined drugs (WHO 1997). The WHO determined that the duration of treatment for MB leprosy could be shortened safely to 12 months "without significantly compromising its efficacy." Other drugs that are used include ethionamide, aspirin, prednisone, and thalidomide (Adam Med. Enc. 2005). Improving detection of the disease will allow people to begin treatment earlier. Improving education about Hansen's disease will help people to understand that the disease is neither highly contagious nor incurable. In 2000, the World Health Organization listed 91 countries in which Hansen's disease is endemic. India, Myanmar. and Nepal contained 70 percent of cases. In 2002, 763,917 new cases were detected worldwide, and in that year the WHO listed Brazil, Madagascar, Mozambique, Tanzania, and Nepal as having 90 percent of Hansen's disease cases. Hansen's disease is also tracked by the Centers for Disease Control and Prevention (CDC). Its prevalence in the United States has remained low and relatively stable. There are decreasing numbers of cases worldwide, though pockets of high prevalence continue in certain areas such as Brazil, South Asia (India, Nepal), some parts of Africa (Tanzania, Madagascar, Mozambique), and the western Pacific. Aside from humans, other creatures that are known to be susceptible to leprosy include the armadillo, mangabey monkeys, rabbits, and mice. At highest risk are those living in endemic areas with poor conditions, such as inadequate bedding, contaminated water and insufficient diet, or other diseases (e.g., HIV) that compromise immune function. Recent research suggests that there is a defect in cell-mediated immunity that causes susceptibility to the disease. The region of DNA responsible for this variability may also be involved in Parkinson's disease, giving rise to current speculation that the two disorders are linked in some way at the biochemical level. Although annual incidence—the number of new leprosy cases occurring each year—is important as a measure of transmission, it is difficult to measure in leprosy due to its long incubation period, delays in diagnosis after onset of the disease, and the lack of laboratory tools to detect leprosy in its very early stages. Registered prevalence is a better indicator of the disease burden, since it reflects the number of active leprosy cases diagnosed and receiving treatment with M.D.T. at a given point in time (WHO Study Group 1985). New case detection is another indicator of the disease burden and usually reported by countries on an annual basis. It includes cases diagnosed with onset of disease in the year in question (true incidence) and a large proportion of cases with onset in previous years (termed a backlog prevalence of undetected cases). The new case detection rate (N.C.D.R.) is defined by the number of newly detected cases, previously untreated, during a year divided by the population in which the cases have occurred. Endemic countries also report the number of new cases with established disabilities at the time of detection, as an indicator of the backlog prevalence. However, determination of the time of onset of the disease is generally unreliable. As reported to WHO by 115 countries and territories in 2006 (WHO 2006). The reason for the annual detection being higher than the prevalence at the end of the year is that new cases complete their treatment within the year and therefore no longer remain on the registers. Table 1 shows that global annual detection has been declining since 2001. The African region reported an 8.7 percent decline in the number of new cases compared with 2004. The comparable figure for the Americas was 20.1 percent, for South-East Asia 32 percent, and for the Eastern Mediterranean it was 7.6 percent. The Western Pacific area, however, showed a 14.8 percent increase during the same period. Table 2 shows the leprosy situation in the six major countries that have yet to achieve the goal of elimination at the national level. It should be noted that: a) Elimination is defined as a prevalence of less than 1 case per 10,000 population; b) Madagascar reached elimination at the national level in September 2006; and c) Nepal detection rates are reported from mid-November 2004 to mid-November 2005. The Leprosy Mission of Canada estimates that 4 million people are currently suffering from leprosy (L.M.C. 2007). When the WHO declares that leprosy has been eliminated, according to their definition of 1/10,000, then in a world of 6 billion people that leaves 600,000 people with leprosy. A.D.A.M. Medical Encyclopedia. 2005. Leprosy. Drugs.com. Retrieved August 4, 2007. Centers for Disease Control and Prevention (CDC). 2005. Hansen's Disease (Leprosy). Centers for Disease Control and Prevention. Retrieved March 22, 2007. Doull, J. A., R. A. Guinto, R. S. Rodriguez, et al. 1942. The incidence of leprosy in Cordova and Talisay, Cebu, Philippines. International Journal of Leprosy 10: 107–131. Leprosy Mission of Canada. 2007. Leprosy could cause a new threat says BBC report. Leprosy Mission of Canada. Retrieved August 5, 2007. McNeil, D. G. 2006. Worrisome new link: AIDS drugs and leprosy. New York Times October 24, 2006. Retrieved May 7, 2007. Rawcliffe, C. 2001. Learning to Love the Leper: aspects of institutional Charity in Anglo Norman England. Anglo Norman Studies 23: 233–252. Schaffer. 1898. Arch Dermato Syphilis 44: 159–174. Souvay, C. L, and J. F. Donovan. 1910. Leprosy. Catholic Encyclopedia, Volume IX New York: Robert Appleton Company. Tayman, J. 2006. The Colony: The Harrowing True Story of the Exiles of Molokai. Simon & Schuster. ISBN 074323300. World Health Organization (WHO). 1994. Chemotherapy of Leprosy, WHO Technical Report Series 847. World Health Organization. Retrieved March 24, 2007. World Health Organization (WHO). 1997. [http://www.who.int/lep/resources/expert/en/index.html Seventh WHO Expert Committee on Leprosy. WHO Technical Report Series 874. Retrieved March 24, 2007. World Health Organization (WHO). 2006. Global leprosy situation, 2006. Weekly Epidemiological Record 81(32): 309 -316. World Health Organization (WHO). 2007 Making a difference: Leprosy. World Health Organization. Retrieved July 4, 2007. Leprosy - Stanford University site. Hansen's Disease (Leprosy) - Centers for Disease Control and Prevention. Leprosy elimination - World Health Organization (WHO). International Leprosy Association - History of Leprosy. BBC News: Slave trade key to leprosy spread. Pathology Images of Leprosy and Other Granulomatous diseases Yale Rosen, M.D. This page was last modified on 27 June 2018, at 16:59.